Why Choose M.R. Jutzi Auctions? M. R. Jutzi & Co. exclusively uses the Retail Auction method of marketing and only sells equipment by Auction and is open to the public. We are not the subsidiary of a equipment dealer. Our only purpose in our retail auctions is to get the best possible price for your goods and equipment. Since we are commission based, the more money we make for you, the more we make for us. First, it is a quick way to dispose of large quantities of goods at fair market value, before its equity value is eroded by holding costs such as insurance, as well as, depreciation, rust & damage. M.R. Jutzi & Co. has developed the municipal auction to the point where anything owned or used by a municipality can be sold by our retail auction and receive a fair price. This development includes buyers, auction setup, advertising and proper auction sales techniques. Second, we know how to sell to the public. Our main auctioneers have over 60 years combined retail sales experience. Calvin Jutzi has over 35 years of banking, retail & industrial equipment sales experience and holds an Honours Bachelor of Business Administration (BBA), with co-op, from Wilfird Laurier University. Third, we are a second generation family auction firm that has been conducting auction sales for over 55 years. Our name is on the door, so you can be sure we strive to be honest and trustworthy. At our auctions the ones who sign the contracts, set-up, and conduct the day to day operations are the same ones who actually sell the equipment and always have been. Our staff has a proven track record, so from security to selling, you can be sure our experience is second to none. Fourth, we make our money on the commissions we earn from our clients. We do not buy and sell equipment outside the auction. Our competitors have public vehicle and equipment auctions as a sideline to their dealerships and equipment sales. At M.R. Jutzi & Co. we run a number of annual event auction sales including our spring turf auction on the first Saturday of April, and our fall snow and municipal auction on the third Saturday of September. We also have a monthly public vehicle auction on the second Saturday of each month. All of these are perfect venues to sell your surplus vehicles and equipment. Since we cater to the end user as opposed to dealers, the prices are closer to retail rather than to wholesale prices. We start and drive all vehicles and equipment through our indoor sales arena. This enhances your equipment’s value, as the buyers can hear and see the vehicles driving. We also transfer the vehicle ownerships into the buyers name. This is done to protect your interests. We have developed our extensive mail and e-mail lists to directly contact upwards of 5000 people for each auction, and with our flyers we attract many repeat customers. Along with an aggressive trade paper, newspaper and website advertising campaign that is geared towards the "first timers." There are plenty of people all eager to purchase the equipment you have to sell. We have a reputation of being selective of our consignments and selling good merchandise for good dollars and we intend to keep doing that for you. If you would like to sell your car, truck, or van please email or call us with the following information about the vehicle: year, make, model, mileage, shape and condition, and if there is an e-pass. If you have tools and equipment you would like to sell please contact us with a list and/or description and the auctioneer will discuss your options. For larger amounts of equipment we can do an onsite auction sale, otherwise we can store the items at our facility until auction day. A buyer's premium is an extra charge that many auctioneers use. It is typically a percentage (10-20%), but can sometimes be a flat fee (as high as $500 per item) that is added to your final bid price that goes directly into the auctioneer's pocket, and that's plus taxes. Here at M.R. Jutzi Auctions we do not charge a buyer's premium. What you bid is what you pay. Can only dealers sell at your auctions? Each and every one of M.R. Jutzi Auctions is open to the public. From vehicles to heavy machinery anyone can sell or bid. 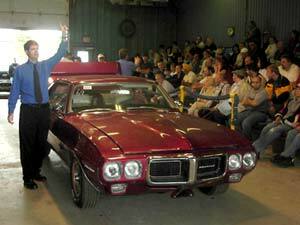 We have our upcoming auctions listed on our web site under, Upcoming Sales. You can also join our e-mail list to find out directly when we have an upcoming sale at E-mail List. Be the first to know. Here at M.R. Jutzi we have been doing public vehicle auctions for over 40 years. We sell vehicles on behalf of various municipalities, banks, leasing companies and police departments from across Southwestern Ontario. We typically have over 80 vehicles every month to choose from so there is something for everyone.